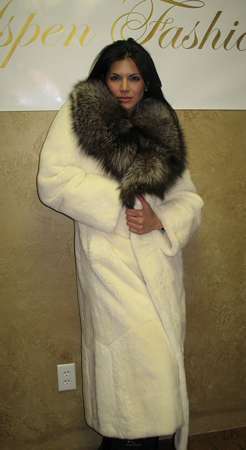 Joyce Giraud wearing the White Fur Coat with Fox Collar, Model 6998. Joyce Giraud, second runner-up Miss Universe, Miss Puerto Rico. Movie Credits include Baywatch, Latin Dragon, Miss Cast Away, Dude, Where's My Car. Starring in Diva Detectives (TV) and co-host Viva TV.